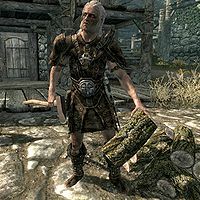 Thadgeir is a Nord warrior from Falkreath who, like Tekla, is living in his brother Dengeir's house, the former Jarl of Falkreath. The current jarl, Siddgeir, is their nephew. He wakes at 6am and eats breakfast for an hour. At 7am, he heads out and chops wood for five hours outside Dead Man's Drink. At noon, he heads into the inn and relaxes for the rest of the day. At midnight, he heads home and goes to bed. He wears a set of leather armor with a matching pair of boots. He is equipped with a steel sword, and carries a key to Dengeir's house as well as a selection of common items and gold. Upon greeting you for the first time, he'll remark: "Unless you intend to bury someone this isn't the place you're looking for, traveler." Subsequently, he'll greet you with: "Falkreath was once full of wanderers and warriors like yourself. Those were better days. ", "Skyrim's history of war is well documented here in Falkreath's graveyard. ", and "My brother Dengeir can be... difficult. Take his words with a grain of salt." When you mention he said something about a burial, he'll ask you a favor: "Falkreath is known for its graveyard, traveler. We've buried more dead than you can imagine. I just finished giving my old war companion, Berit, a proper burial by fire. Old hard head hated the idea of being lost cold in the ground. Could you deliver the ashes to Runil, the priest of Arkay? He'll know the right blessings to make for Berit's soul." If you tell him you don't have time, he'll be annoyed: "Typical." If you agree, he'll be grateful: "Thank you." Thadgeir: "Don't let my brother get to you, Tekla. You're doing a fine job around here." Dengeir: "Do you think Tekla has been talking to Siddgeir again?" Thadgeir: "We've been over this, Den. Tekla does not share your secrets with Siddgeir." Dengeir: "Hmmf. Maybe you're the one talking to him then..."
Interestingly, he is part of both the Imperial Government, and the Sons of Skyrim Government factions. According to the Creation Kit data, he is an acquaintance of Runil, a confidant of Tekla, and an ally of Helvard and Nenya. This page was last modified on 29 June 2018, at 19:40.